Are you in the market for an air conditioner in Winnipeg? 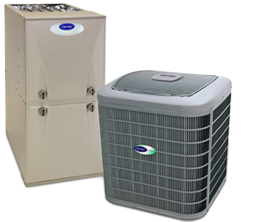 Whether your existing model isn’t getting the job done, you’d like to upgrade or you’re moving into a new home, Provincial Heating & Cooling has a wide selection of reputable, name brand air conditioners for you to choose from. Along with residential customers, we also work with a number of commercial and residential customers as well. Our knowledgeable and experienced staff will be happy to answer all of your questions and ensure you have all the information you need to make an informed decision. If you’re having trouble deciding whether you even need a new unit, there are a few important pieces of information to keep in mind. Consider the Age of Your AC Unit – There’s a simple rule of thumb to follow when it comes to the age of your unit. When it needs repairing, multiply the age of the unit years by the repair cost—if the answer is more than $5,000, it’s time to replace your unit. Energy Efficiency – Given the recent advances in air conditioning technology, there are now AC units available with incredible energy efficiency ratings. If your current unit is more than 10 years old (or is younger, but still lacking decent efficiency), we recommend considering a new unit for savings on your energy bills. External Factors – There are a number of other signs it may be time to replace your unit, including how frequently it needs repairs, if your energy bills are rising, how long you plan on living in your current house and more. If there’s an air of superiority to these units, it’s because they’re the quietest, most efficient models Carrier® makes. Built for total home comfort, the Infinity series central air conditioners offer an enviable SEER rating of up to 21. Combine it with the innovative Infinity® control for the highest degree of comfort management. Presenting a reliable, energy efficient and quiet way to cool your space—no matter how much space you have. In addition to a traditional air conditioner, the Performance series line includes a compact unit for tighter installations. Both types can operate more quietly than most dishwashers and offer impressive SEER ratings. Looking for the most economical way to improve the reliability and efficiency of your central air conditioning system? Turn to the Carrier® Comfort series. With impressive SEER efficiency ratings ranging up to 16, they’re likely to cut your utility bills. And because these models can run even quieter than a common hair dryer, it’s easier on your ears as well. If you’ve decided it’s time to take a look at our wide range of new air conditioner units in Winnipeg, we encourage you to book a consultation by visiting our contact page for our phone number and more information. Just wanted to let you know how pleased I was with the work done by your crew yesterday in installing a new furnace and air conditioning unit in my home. They came on time, were very courteous, and provided answers to all my questions. They cleaned up all the old equipment and left the yard and house spotless. They finished by demonstrating how to utilize the new features of the new equipment. I would not hesitate to recommend your company to others. Thanks Again!